When I think of the word substance, I think of weight. I think of density. A bowling ball, a newborn baby, a dying sun. I think of what actually makes up the matter of someone or something, beyond the mask or façade on display. Disclaimer: I have no way of measuring the density of this artistic rendition of a star. But, to me, it looks dense. We attach varied levels of importance to things tangible and intangible according to the meaning and value they have to our individual experience. Yet the word always carries the same meaning for all of us. When we say something is of substance we are vouching that it possesses a depth beyond that which can be recognized on the surface, and that depth is essential to its meaning or existence. Substance is the existence of something beyond what we see and, more often than not, it is something of value. Humans are the perfect example of what it means to have substance. We are much more than the surfaces we allow each other to see. We are never skin deep. Each one of us is the result of the hundreds of thousands of intricate internal and external relationships and experiences. We appear to be made up of seamless and simple skin on the outside, yet internally we are a patchwork of a million personal pieces unique to ourselves. It is this chaos inside of us, and not the calm surface, that makes us human. It is what separates us from one another; it is what differentiates us from the similar skin we’re all sharing. Your internal substance is the part of you that isn’t easy to read or boring to learn about. The vivid and unique oils of your internal landscape are a personal portrait. Consistently being altered by the paintbrush of life, each stroke of colour adds to an already endless wonderland of adventure and intrigue. 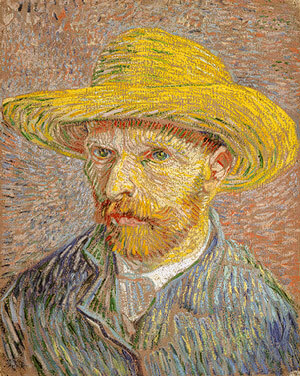 Self-Portrait with a Straw Hat (1887) by Vincent van Gogh. So why then, are we so obsessed with hiding our complexity? We meticulously maintain and groom our shallow surfaces. We carefully polish our vast array of smiles and we rehearse our jokes – for those are the weapons we’ll arm ourselves with during this weekend’s social campaign. We place an unhealthy importance on the mastery of crafted emotions; our gasps of shock and fits of laughter must be believable and emphatic. We carefully iron out our faces after our trousers and we use the same mirror to apply our emotions in the same way we do our lipstick. We spray on our personality with our fragrances. We wear around our necks the persona we want others to see and then we hang Tiffany pendants and wooden crosses from them. Our outward expressions, no longer useful tools in demonstrating the inward feelings we ignore, have become gadgets we use to accentuate our surface appearances. They serve the same purpose as our Marc by Marc Jacob clutch that matches our new Prada pumps or our Burberry tie that creates that must-have contrast with our Armani suit. We’ve somehow began equating our surface with our substance. We’re only as beautiful as our most recent Facebook profile picture, the filter we choose for it, and how many likes it receives. Our experiences are summed up in small collages and uploaded to Instagram, its value judged by how many people stamp their approval with little digital hearts. We’re only as healthy as our body-fat percentage tells us we are, or the amount of gluten we avoid. Our spirituality is defined by the colour of our Lulu yoga mat. We’ve forgotten that there is an entire world inside of us. It is a world full of experiences, memories, ideas, ambitions, and beliefs. It is a place that would take a lifetime for us to completely explore. There is a magnificent kingdom inside all of us. When will you find yours? Yet we’ve never cared to examine or maintain this inner kingdom. Our inner selves have become, like Dr. Frankenstein’s monster, crudely sewn and stitched together with ideas scavenged from the surface. Surface-deep ideas of what the superficial world insists makes us a whole person. Instead of planting the seeds of wisdom, acceptance, confidence and self respect in our endless internal garden, we’ve left the weeds of ignorance, denial, doubt, and loathing to grow in their place until they strangle us. The demons who feed off of these negative plants – such as fear, jealously, sadness, and paranoia – have grown strong and have multiplied. They prowl unchecked in the shadows of ourselves, and have become the tyrant kings of our domains while we have become strangers in the only place we can truly call our own. Look well into thyself; there is a source of strength which will always spring up if thou wilt always look there.” – Marcus Aurelius, Meditations. So maybe skip the hair /nails /tanning appointment or the gym today (unless its leg day – don’t skip that). Find a patch of grass and sit in silence. Watch your endless thoughts drift slowly by like the calming stream that they are. Trade in your typical Saturday night debauchery for something that inspires real growth. Instead, sit around a table with a few close friends – turn off your phones – and really connect with one another in real, human conversation. Whatever you feel inclined to do, take some personal time and trim the rabid weeds strangling your soul. Plant the positive seeds of wisdom, acceptance, confidence and self respect that will grow into the beautiful garden you can be. Take back your kingdom, even if it’s inch by inch. Do a little bit every day. Like Rome, you won’t be built in a day. In fact, you’ll never stop planting, cultivating, and exploring yourself. As a child of the stars, you are as limitless and as endless as the beautiful universe from which you came. You are dense. You are full of substance. You are perfect.